The Carus Classics series features outstanding CD productions from Carus’ past library of recordings. The series has been designed exclusively by the well-known graphic artists Friedrich Forssman und Cornelia Feyll. Josef Gabriel Rheinberger’s well-loved and often performed masses Missa St. Crucis op. 151 and the Missa in A op. 126 for women’s choir, in addition to other works, have been recorded on this CD. 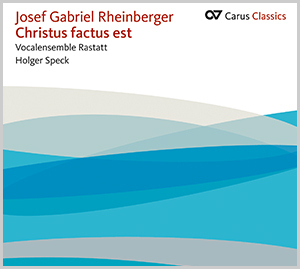 Once again, the Vocalensemble Rastatt conducted by Holger Speck, with its highly refined sound, technical brilliance and lively musicality, delivers a convincing performance on this CD.